A high resolution video is incomplete if it is not supported with high-fidelity sound. The Zoom H4N digital stereo recorder packs in a range of features supporting high quality sound recording. 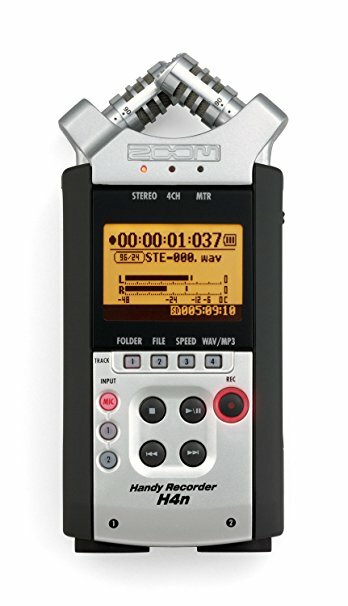 This lightweight recorder is extremely portable and sport a superior built. The H4N's body has a thick rubber coating on each side, which is very effective in handling the noise. The device is solidly manufactured ready to tackle minutest disturbance and give you a professional sound. The recorder also features a large 1.9 inch backlit LCD display, which gives all the details like number of channels, log time, file format and battery indicator which proves advantageous at the time of recording. The H4N recorder allows you to record on 4 tracks simultaneously, using built-in as well as external mics. The simple control layout on the front panel makes it easy to use. It allows you to choose the number of tracks for recording, access folders and files and playback the already recorded files; just by pressing one button you can also select the input options from 2 mic control. The dedicated buttons on the right and left panel allow you to adjust recording level and playback volume respectively. The built-in X/Y stereo condenser mics are designed to ensure that it remains at equal distant from the source of the sound for impeccable localization with no time delay or phase shifting. Also it is easy to adjust to the selectable recording width of 90° or 120°. The built-in X/Y microphones are designed to deliver stunning stereo sound. The WAV files recorded with H4n have a frequency of 24-bit with 96 kHz and are automatically time-stamped ensuring seamless sync with the video footage. The uniformity of frequency response is maintained throughout the recording resulting in dramatic stereo recording with accurate natural depth. The unique feature of H4N handheld recorder is its ability to record 4 channels simultaneously, using its onboard and external mics. You can also use the in-built mixer to blend the channel perfectly for a balanced recording. The H4N recorder gives you a choice of saving your recorded files in either WAV or MP3 format. WAV files are uncompressed and thus, provide optimum quality. The recorder directly record sound to the external SD or SDHC cards of upto 32GB, with maximum record time depending on the file type and card size. The H4n requires 2 AA batteries which enable 11hours of continuous recording.